It is often difficult to isolate pain to a specific part of the digestive tract beyond the stomach. Pain in the esophagus is usually felt in the chest, Pain in the stomach is felt under the left ribcage and upper left part of the abdomen. But the coiling of the intestines, both small and large, makes it difficult to isolate the pain to a specific point. It is usually experienced as abdominal pain but whether this arises from the small intestine or colon can be tricky to identify. Duodenal pain refers to any pain that arises from the duodenum. This is the first part of the small intestine that starts where the stomach ends and continues for about 25 to 38 centimeters (about 10 to 15 inches) until the jejunum which is the second part of the small intestine. 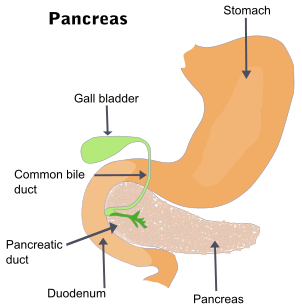 The C-shaped duodenum would lie approximately within the epigastrium (upper middle region of the abdomen). However, there are many other organs that lie in or close to this region and other symptoms are necessary to identify duodenal pain. Refer to the duodenum location for more detailed information. The duodenum is the gateway to the bowels which communicates with several parts of the digestive system. Understandably it is prone to may diseases that may be related to its surrounding regions and neighboring organs like the stomach, pancreas, gallbladder and the common bile duct. But the duodenum is not just a communication point. It also serves important roles in digestion and absorption of nutrients. Therefore diseases of the duodenum may not only result in pain but also present with a range of digestive symptoms. It is important to understand what the duodenum has to contend with on a daily basis. Acidic stomach contents pour into the duodenum which does not have the same ability as the stomach to withstand this acidity. The acid needs to be rapidly neutralized in the duodenum. It is also subjected to strong digestive enzymes which pour in from the pancreas via the common bile duct. The duodenum has to be able to withstand these enzymes. These are just the normal insults that the duodenum faces on the average day. Some of the causes of duodenal pain are discussed below and related to abnormal situations and diseases of the duodenum. Inflammation of the duodenum is known as duodenitis. It can occur for a number of reasons but most often from influx of stomach acid and digestive enzymes, beyond the duodenum’s ability to handle it. Duodenitis is often associated with gastritis and the same factors can cause both conditions, like an infection with H.pylori bacteria and the excessive use of NSAIDs. Duodenitis may also be associated with cholecystitis (gallbladder inflammation), cholangitis (bile duct inflammation) and pancreatitis. Ulcers in the duodenum are a common part of peptic ulcer disease (PUD). It is often a complication of duodenitis and may accompany stomach ulcers and even esophageal ulcers. In fact the duodenum is the most common site for peptic ulcers. The open sores (ulcers) in the wall of the duodenum are sensitive to changes in pH, like during and after eating. It can also disrupt normal eating patterns and even lead to changes in body weight. Duodenal cancer, more often referred to as small bowel cancer, is uncommon. It is the growth of a malignant tumor in the duodenum. The malignancy (cancer) may originate in the duodenum or may have started elsewhere in the body with cancer cells spreading to the duodenum (metastasis). There may be little or no symptoms at the outset. The bacterial count in the small intestine is low when compared to the large intestine. A number of different conditions can lead to small intestine bacterial overgrowth, including surgery, AIDS, diabetes and inflammatory bowel disease (IBD). The excess bacteria disturbs digestion and nutrient absorption as well as causing acute inflammatory symptoms. Abdominal pain is not always present. 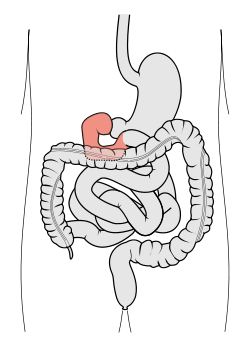 Diverticula are outpouchings of the gut wall. It more commonly affects the colon but can also occur in other parts of the digestive tract, like the duodenum. The pouches are largely asymptomatic but may be infected and inflamed leading to a host of acute symptoms. It can also rupture with potentially serious consequences if not treated promptly. Duodenal pain is a symptom on its own which may be due to some of the conditions mentioned above. Identifying duodenal pain solely by the location may not always be accurate. It lies in close proximity to the stomach, pancreas, liver, gallbladder, transverse colon and other parts of the small intestine. Pain in these areas may therefore be mistaken for duodenal pain. However, the following symptoms may help to differentiate duodenal pain although these symptoms are common in diseases of neighboring organs to the duodenum. Pain that worsens during and immediately after eating. Feeling of fullness (bloating) after eating even a few bites. Blood in the stool (melena). Fever and jaundice may be symptoms of diseases of neighboring organs that could cause duodenitis. The treatment of duodenal pain depends on the cause. It can therefore vary significantly. Duodenal pain warrants further investigations before treatment is commenced. This may include blood and stool tests, small intestine x-ray, abdominal ultrasound and upper GI endoscopy. Antibiotics for bacterial and protozoal infections. Acid-suppressing drugs like proton pump inhibitors. Bismuth-based drugs to coat the intestinal lining. Surgery may be necessary for some causes of duodenal pain, like in cancer. Other treatment measures in these instances may include chemotherapy and radiation therapy. The same dietary management and lifestyle changes that may be prescribed for conditions like gastritis could be helpful for duodenal pain. However, it depends on the cause of the pain. Nevertheless these measures are worth implementing alongside drug therapy and surgery where necessary. Avoid spicy food and other edible irritants. Fatty/oily, processed and preserved foods may also be irritants. Stop cigarette smoking or the use of any other stimulants. Moderate the intake of medication as advised by a doctor or pharmacist.